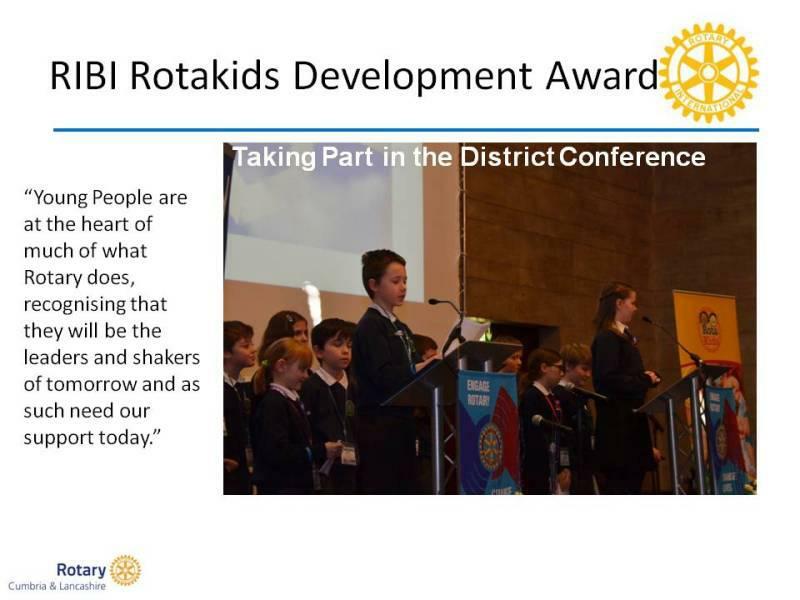 Rotary in Cumbria & Lancashire first to win Rotakids National Award. Rotary District 1190 are the first recipients of the new RIBI Rotakids Development Award. Congratulations to the Rotakids Clubs, Primary Schools & Rotary Clubs who have made this possible. The trophy was presented to DG Kevin by RIBI President Nan at the RIBI Conference in Birmingham on 12th April 2014. Rotakids are groups of 8 - 11 year olds. The purpose is to help build children's self esteem and community service ethics by introducing Rotary concepts of service, understanding and citizenship. Children also have an introduction to project, team and leadership skills. Parents will be encouraged to take part too.